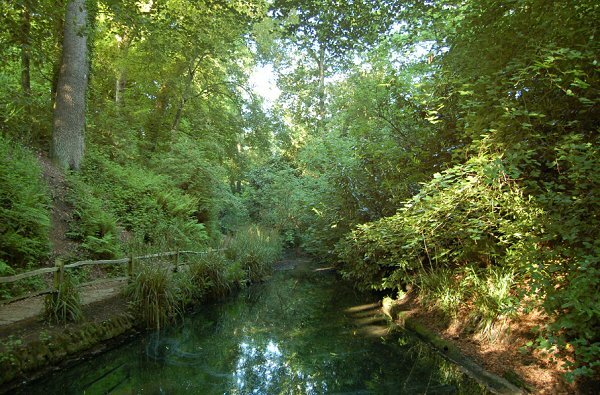 Ninesprings is, essentially, a broad-leaved woodland valley of some twenty acres on the south east edge of Yeovil with nine springs supplying water to small streams and ponds. The water issues into Dodham Brook and, ultimately, to the River Yeo. In 1856 Vickery wrote "John Batten, Esq, and at Nine Springs, the property of the same gentleman. 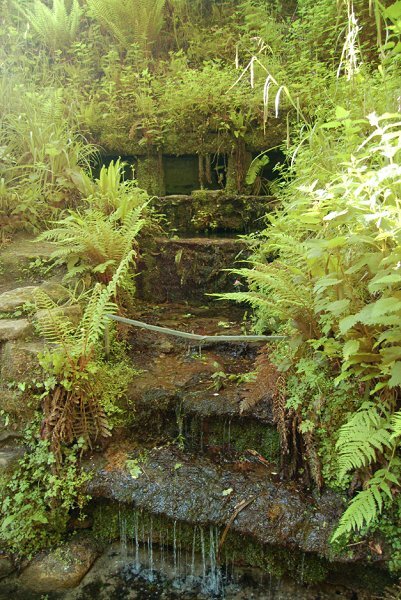 These springs afford a large supply of water, from two to three hogsheads a minute at least, and were they at an elevation sufficient to supply the town, they would be of great value." 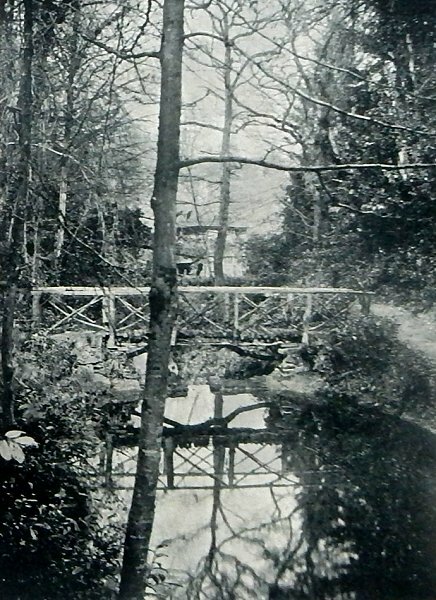 It was developed as an ornamental park for the Aldon estate during the early nineteenth century (although its ownership was brought into question - see Yeovil Charities Scandal) and included walks, bridges, grottoes, springs and lakes. Until the middle of the twentieth century the public only had access by ticket obtainable from the owner, Colonel HB Batten, the Town Clerk. "19 August 1904: Went to Nine Springs this afternoon with Bessie and Maud [her sisters]. It is the first time I have been there as we always thought it impracticable to get there with the carriage [Louisa was wheelchair-bound throughout her life]. But by careful piloting and perseverance I was got right there and a rare treat I had. I could not have imagined there was such a lovely spot within our old prosey [sic] town. It is a veritable paradise, what with its magnificent growth of woods, its wealth of ferns, cascades, trickling springs, still pools, driplets, placid flowing stream, and its numerous many paths and other beauties innumerable." 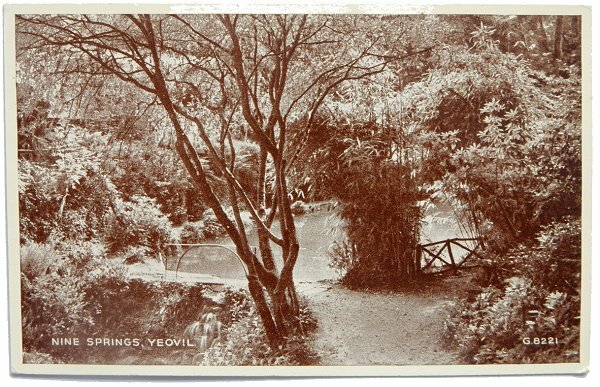 "30 July 1906: We our and Lucy went to Nine Springs this afternoon and had tea at the cottage in the woods. We enjoyed our outing very much. It was so cool and pleasant in the woods, listening to the sound of the water. Tea was spread in a picturesque rustic porch looking down on a still pool bordered by woods, magnificent ferns and all manner of beautiful growths." 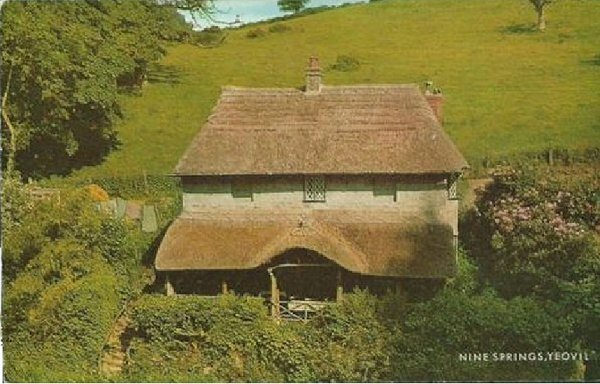 The once picturesque thatched cottage that appears in so many photographs of Ninesprings once served cream teas. 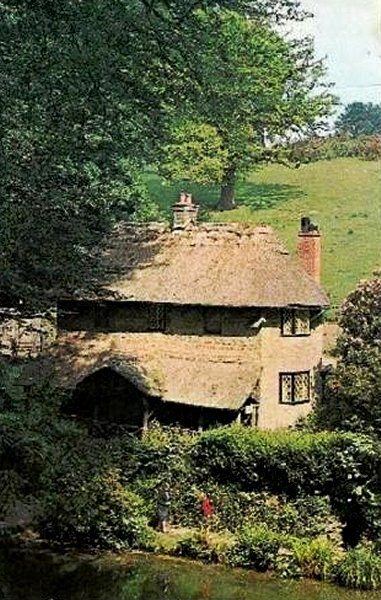 The cottage suffered neglect during the Second World War and was allowed to quietly fall into ruin. It was finally demolished in 1973, although the foundations are still visible. As a small child my wife's ex-mother in law, with her family, was the last person to live in the cottage. 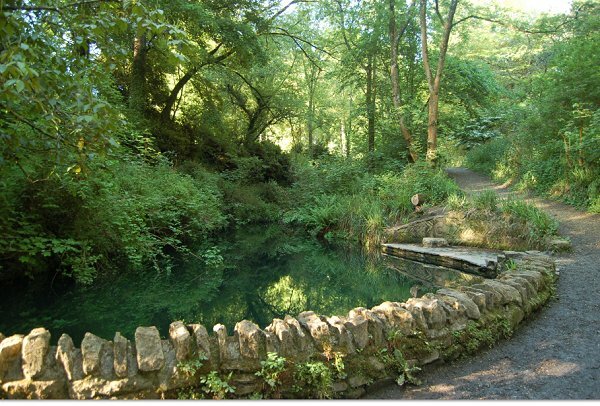 Ninesprings was acquired by the District Council (I think in the 1970s) and now, having been restored, has been incorporated into the 127-acre Yeovil Country Park. 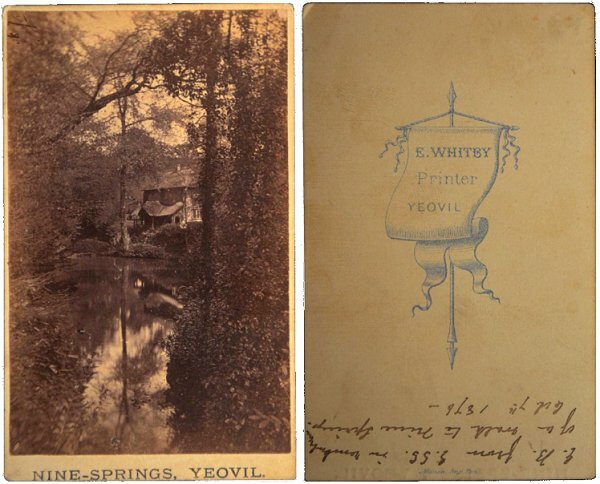 This is the front and back of a carte de visite, or CDV, produced by Ebenezer Whitby, of the cottage at Ninesprings and is probably the earliest of any images of Ninesprings. The writing on the back says "EB from GSS in remembrance of a walk to Nine Springs. Oct 7th 1876". However the fact that it has square corners almost certainly dates the CDV to the 1860s (rounded corners were introduced during 1872 to 1879 to slip into newly-introduced slotted album pages). Much smaller than later cabinet cards, this CDV is 2½" x 4" (65mm x 100mm). 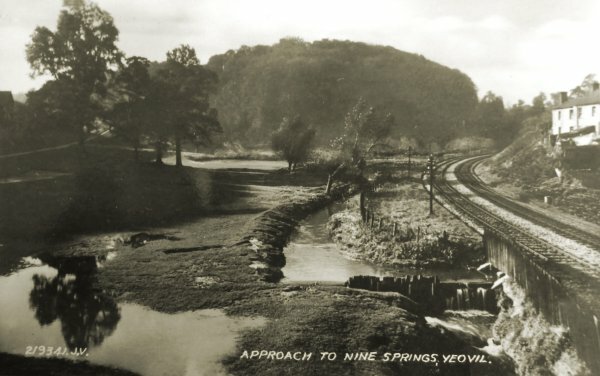 Looking across to Yeovil from Ninesprings in the 1920s. 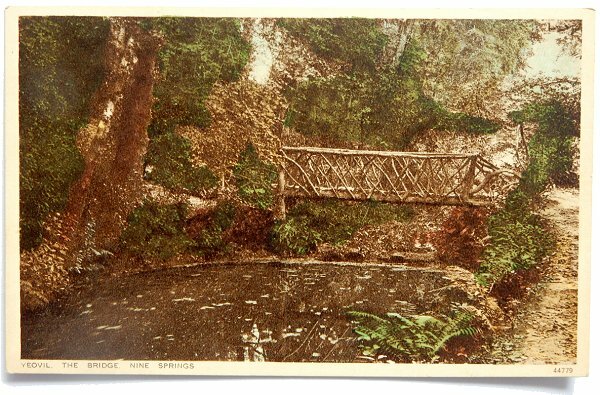 This postcard, dated 1936, shows the rustic bridge crossing the stream at the lower end of the Ninesprings valley. 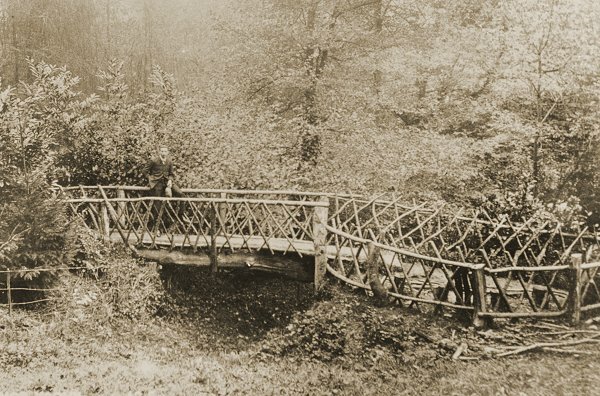 Standing on another rustic bridge, photographed about 1910. 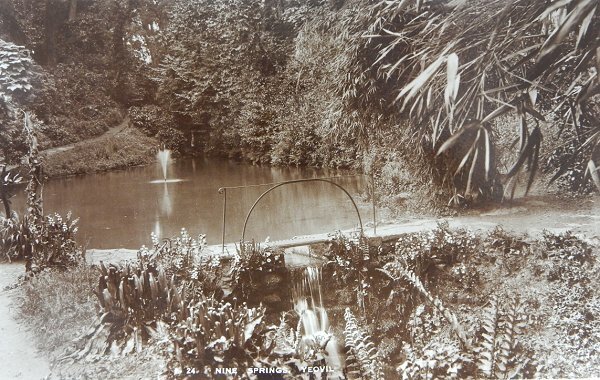 An early postcard showing one of the first of the man-made lakes in the valley. 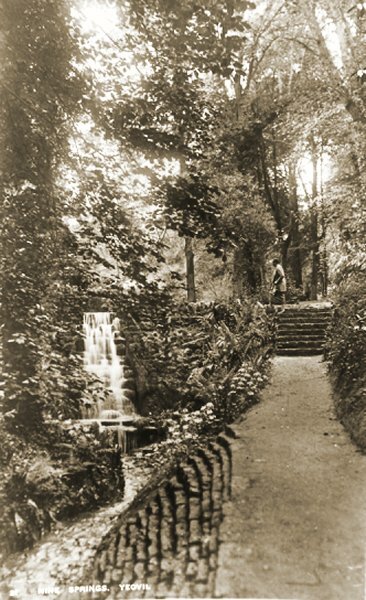 This early postcard shows the approach to one of the cascades beside the path about half-way up the Ninesprings valley. 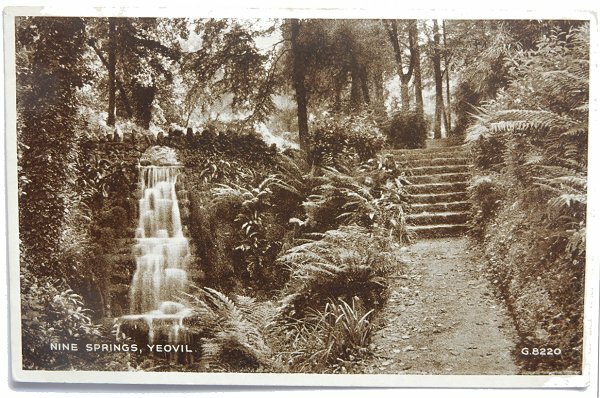 Postmarked 1900, this postcard gives a closer view of the cascade and steps. One of the man-made lakes in the upper valley featuring a fountain - who knew? 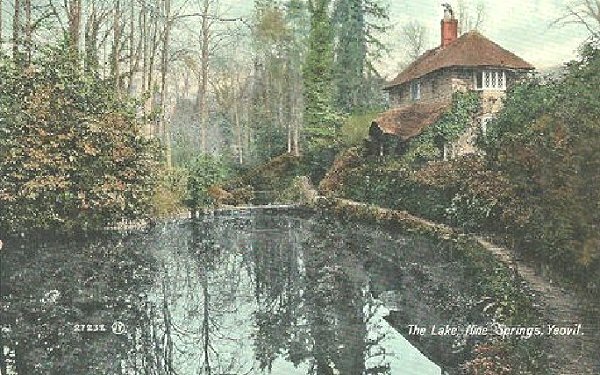 A picturesque hand-coloured postcard of 1905 shows the approach to the cottage. 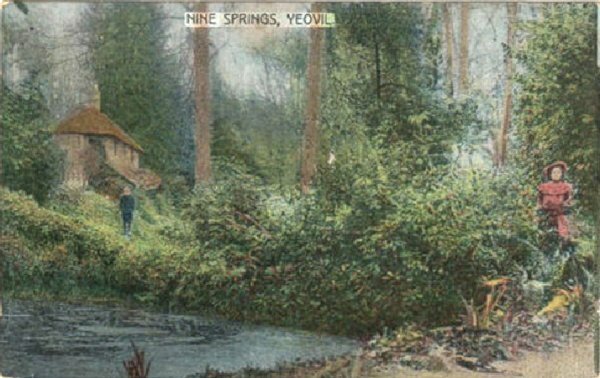 This postcard of 1904 is unusual in that it shows the Batten family at lower left who owned Ninesprings and the cottage at the time. 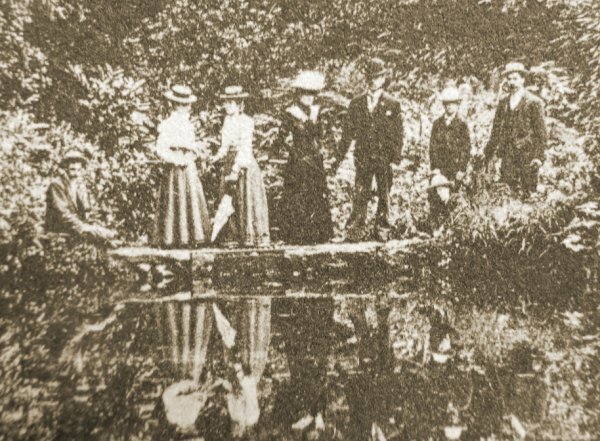 An enlargement of the previous postcard of 1904 showing the Batten family. 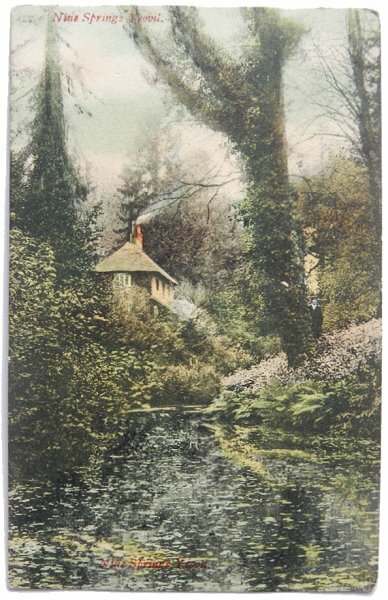 A hand-coloured postcard by William Beale Collins of the cottage at Ninesprings. This card was posted in 1904. 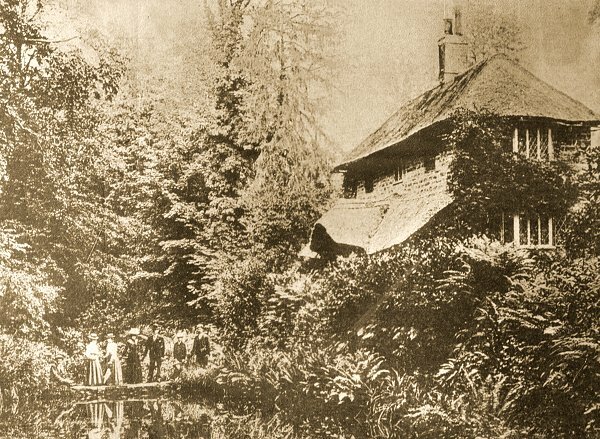 A 'chocolate box' image of the cottage in a postcard of 1906. 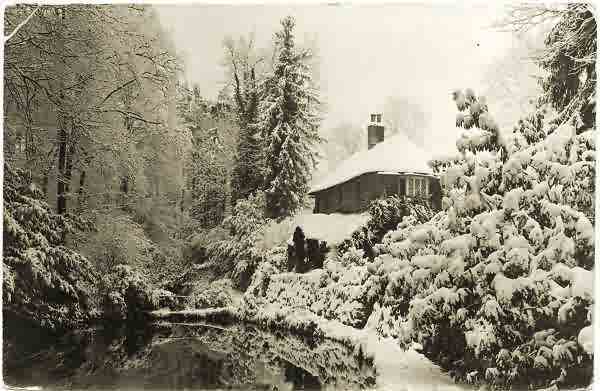 Ninesprings and the cottage photographed during the 'Great Snow' of 1909. 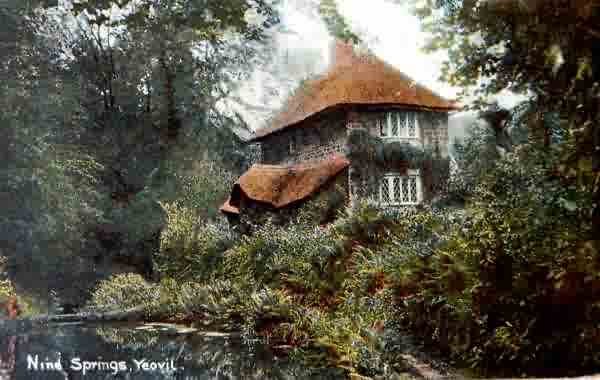 Another 'chocolate box' image of the cottage in a postcard of 1910. 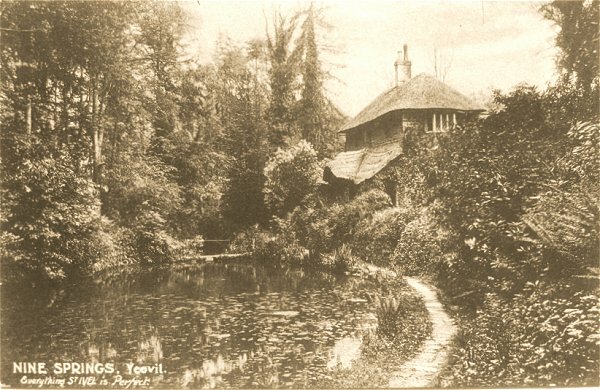 The cottage on a 1914 postcard, one of the Aplin & Barrett "Everything St Ivel is Perfect" publicity campaign. 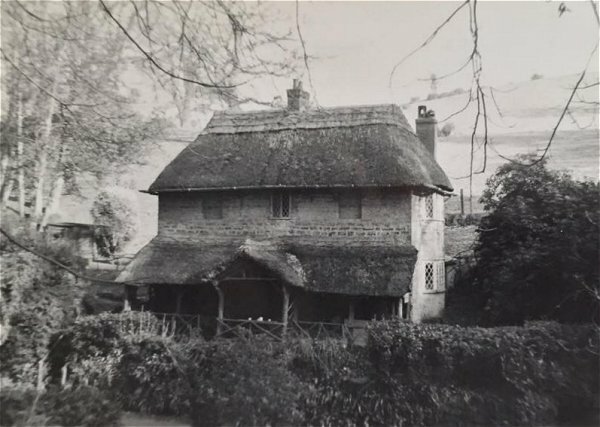 A postcard showing an unusual view of the cottage. The card was posted in 1924. 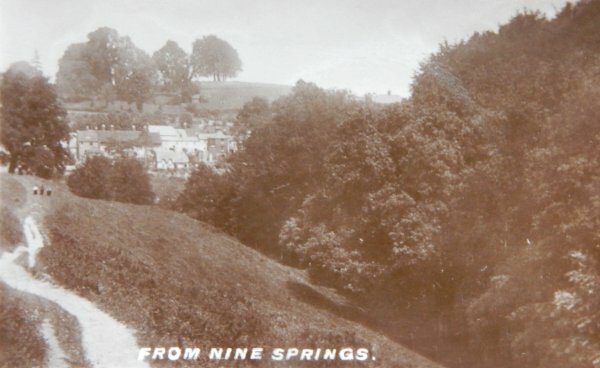 A postcard, probably from the 1920s, of the "Old Drive to Nine Springs". 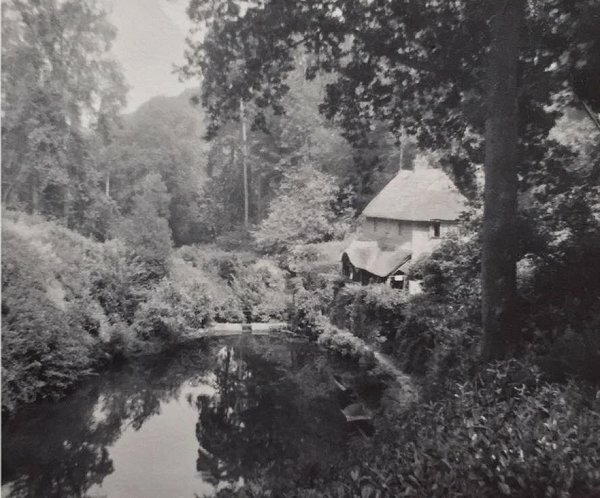 A postcard of about 1939 shows a different view of the cottage in the period shortly before it fell into decline. .... and a similar view taken at a similar date. 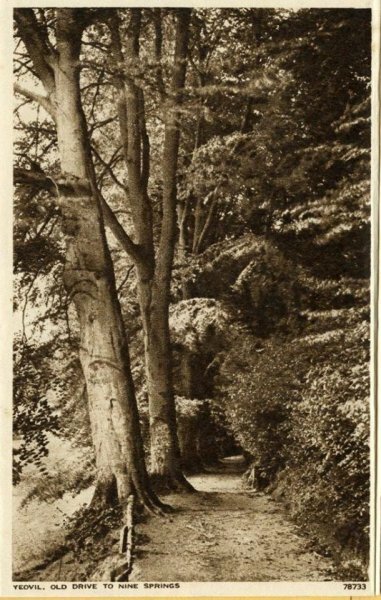 An unusual view of the rear of the cottage in this postcard of 1931. 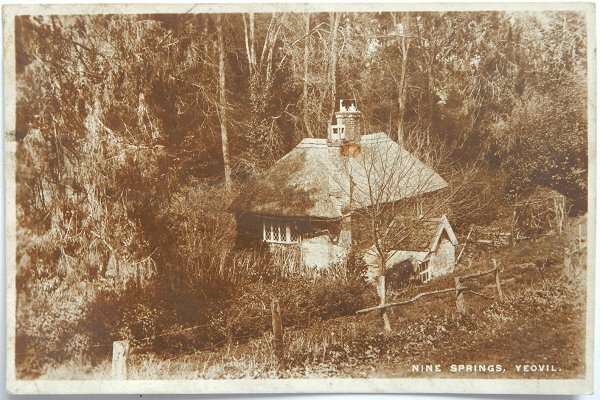 Ninesprings Cottage photographed in its later years. 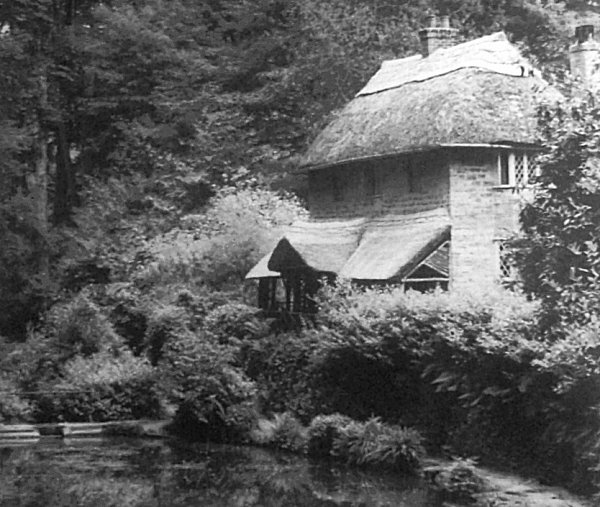 The cottage photographed around 1960. The cottage seen from a little further up the valley. Photographed around 1960. 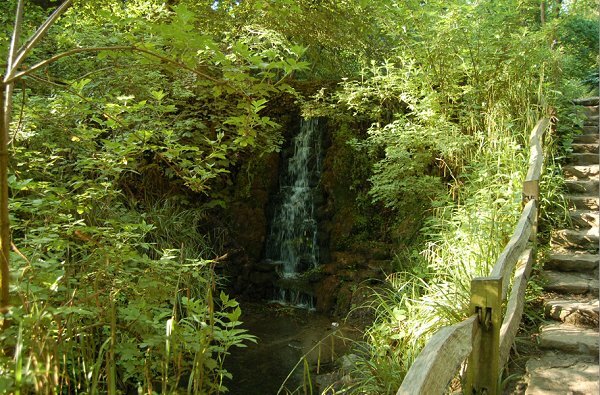 A cascade, photographed from the stream-side walkway, in 2013. A man-made lake, photographed in 2013. 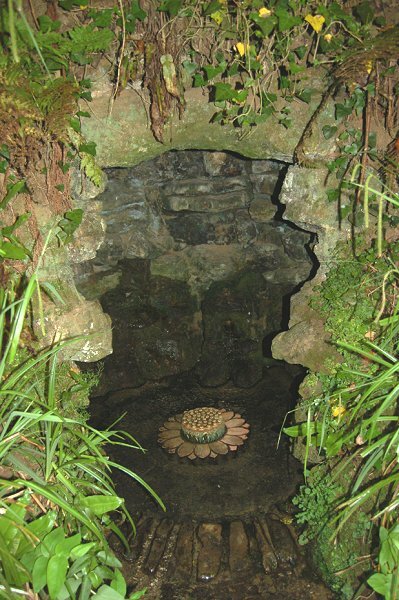 A nineteenth century grotto housing one of the nine springs, photographed in 2013. The stream towards the head of the valley, photographed in 2013. 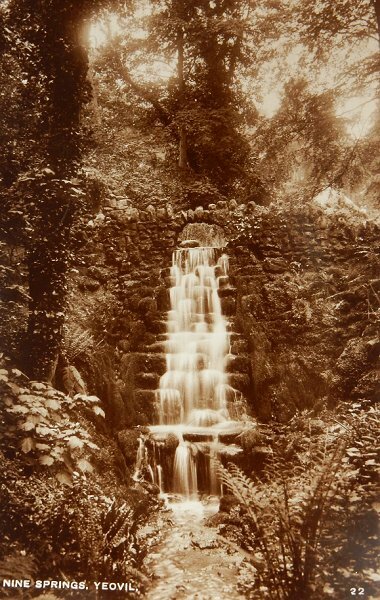 A nineteenth century cascade built around another of the nine springs.